We offer complete cardiology work-ups including a thorough clinical examination, blood pressure measurement, echocardiography (ultrasound examination of the heart), chest x-rays and ECG. 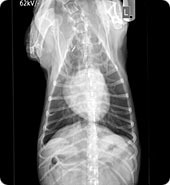 Our digital x-ray capabilities enable us to perform a complete radiographic examination of your pet's heart in minutes, producing high quality diagnostic images. Our ultrasound machine is of the highest quality enabling us to carry out complete echocardiographic examinations including colour-flow doppler, pulse-wave doppler, continuous-wave doppler, B-mode and M-mode measurements. We will shortly be offering a specialist referral service via the internet which will enable your pets cardiology examination to be reviewed by well known European cardiologists.